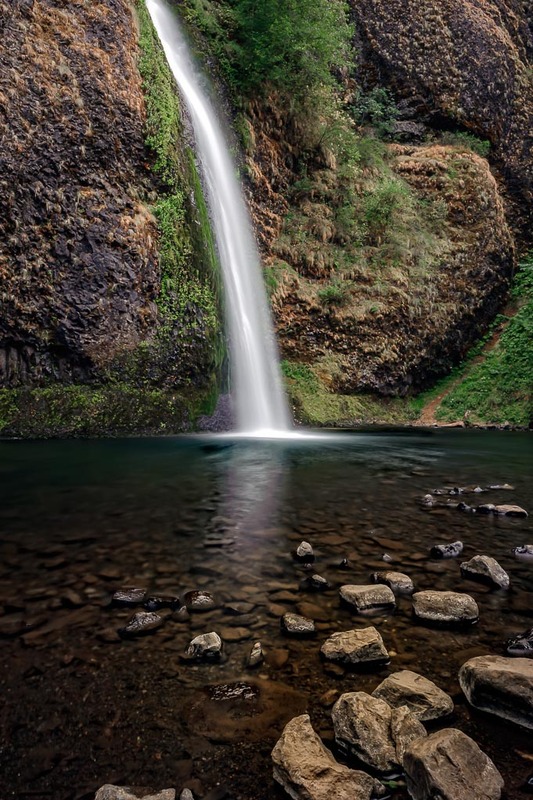 The Columbia River Gorge outside of Portland, Oregon, is a great location for waterfalls. There are 77 waterfalls on the Oregon side of the Columbia River alone, and you would need to spend a lot of time to visit them all. Many of them require hikes, some of which are medium to difficult ones. Fortunately, some of the waterfalls are easily accessible, and some require no hiking at all. For those who only have limited time, take a drive on the Historic Columbia River Highway. The highway allows the visitor to get to 8 waterfalls in a few hours. This is one of those waterfalls, namely Horsetail Falls. It requires no hiking and can be viewed without any obstructions for almost 180 degrees. This image shows the bottom half of the "horsetail" falling into it's small pond.